Mexico City has hundreds of restaurants with different types of food. From Mexican to Argentinian and Japanese you can say we have most of them covered. A good Greek food restaurant was missing in this metropolis and people didn’t notice it. Everything changed a few months ago when Mythos opened in the heart of Polanco. The restaurant became so popular that it was extremely difficult to get a table especially during weekends. As was the usual, I tried going to dinner Saturday night and there was no table available. It was one of those nights that I craved Greek food and was disappointed when the hostess told me there was no table for me. The good news is that they told me they had just opened another Greek restaurant two blocks away and invited me to dine here to try it out. The new restaurant is called Ouzeria and is literally a five minute walk from the other place. We didn’t know what to expect but it was well worth it! The food is also greek but the overall concept is more casual. The menu is mostly tapas, they recommend you order a variety of plates and share them amongst your table. The portions are small but the advantage is that it allows you to try more things. We did as we where told and ordered plates to share. We got several dips including tzatziki (greek yogurt with cucumber), feta cheese with chipotle and babaganoush (eggplant). The saganaki cheese similar to provoleta was delicious as well as the greek style empanadas with vegetables. The typical greek salad with cucumber, feta cheese and tomato was to die for! All the ingredients where as fresh as you can get them and the mix of flavors where just amazing. As main course we got lamb kebabs with some french fries. The plates are small portioned which I really enjoyed especially at night. 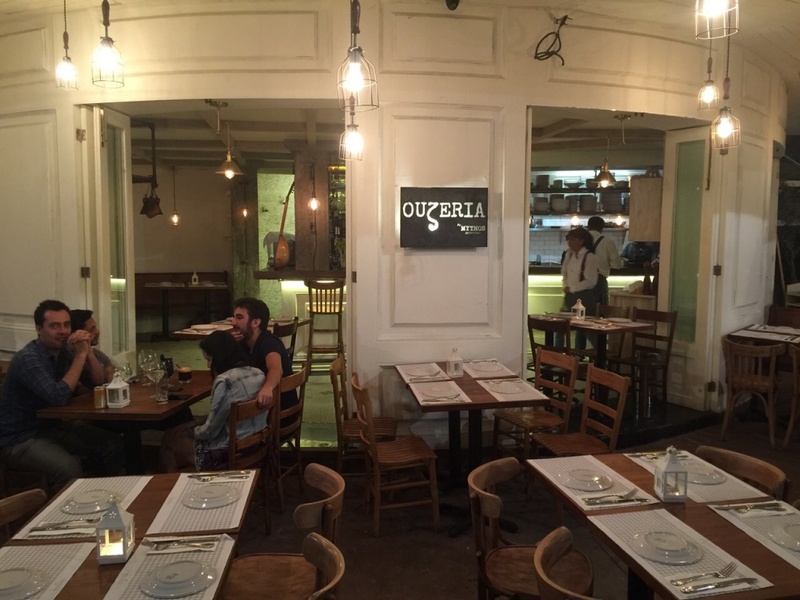 The restaurant is casual and conveniently located in Polanco, where you can find a number of other restaurants. I would definitely recommend going here for lunch or dinner. Its a great place for families with kids and a nice spot for a dinner date. They are still in the soft opening phase but contact them @ouzeria or 5292 8639 to make a reservation.